Do you remember attending Mother/Daughter Banquets? Please come! Be encouraged! 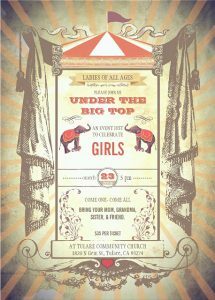 And know that GIRLS are “Under The Big Top” of God’s covering! Join us for an evening of fun and fellowship as we celebrate the relationships between moms, daughters, and friends. The evening consists of special guest speakers Tina and Lizzy Highstreet, a great meal, and fun entertainment! For ages 5-105. Contact Vicki Dykstra, Kirby Dykstra or Deene Souza for more information.